Disclosure: I received items from SwimOutlet.com complimentary, but all thoughts and opinions are my own. I am having the best time in Palm Springs! There’s honestly nothing more relaxing than lounging in a float on a hot summer day, seeing my daughter giggle as we splash around and play in the water with the beautiful desert mountains surrounding us. We recently had a tropical themed aesthetic by the pool in Palm Springs on our vacay, and then yesterday we had a very Minnie Mouse pool party. Courtesy of SwimOutlet.com, we had a Minnie Mouse kickboard, beach ball, and a beautiful Minnie Mouse tutu swimsuit and matching terrycloth cover-up. 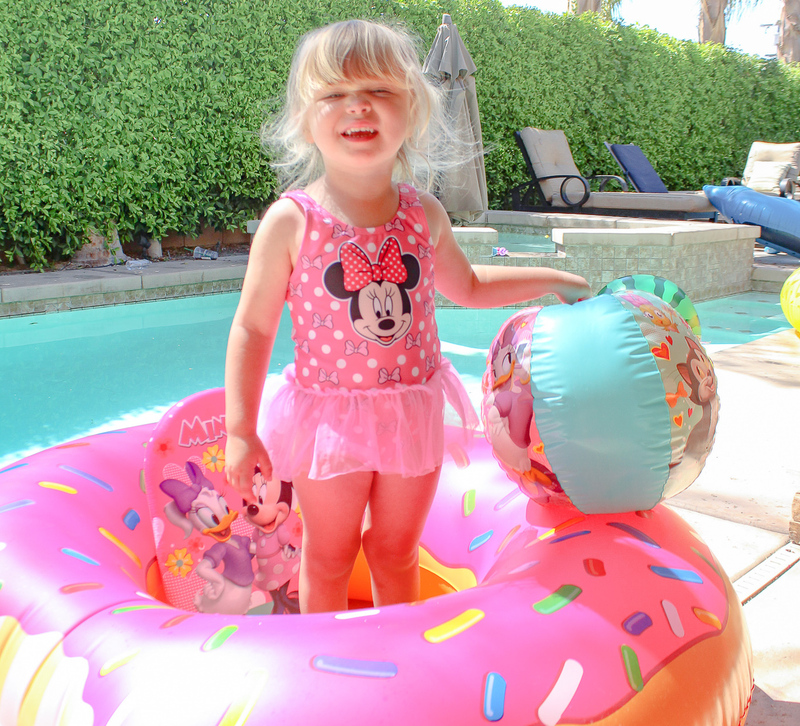 To pair with the Minnie Mouse pool goodies, we got a Big Mouth donut floatie, since we thought the cute, bright pink donut went well with the Minnie Mouse aesthetic. She just loved her Minnie Mouse beach ball, since it also had Daisy and Figaro on it (two of her favorite Disney characters). It was definitely her favorite pool toy on the trip! To go with the large donut float I used, my daughter also had a small donut float from Big Mouth with leg whole for a toddler, so she could be in the pool with both hands free to use her water blasters! It was such a fun day to add some pink, Minnie Mouse fun to our family pool time!